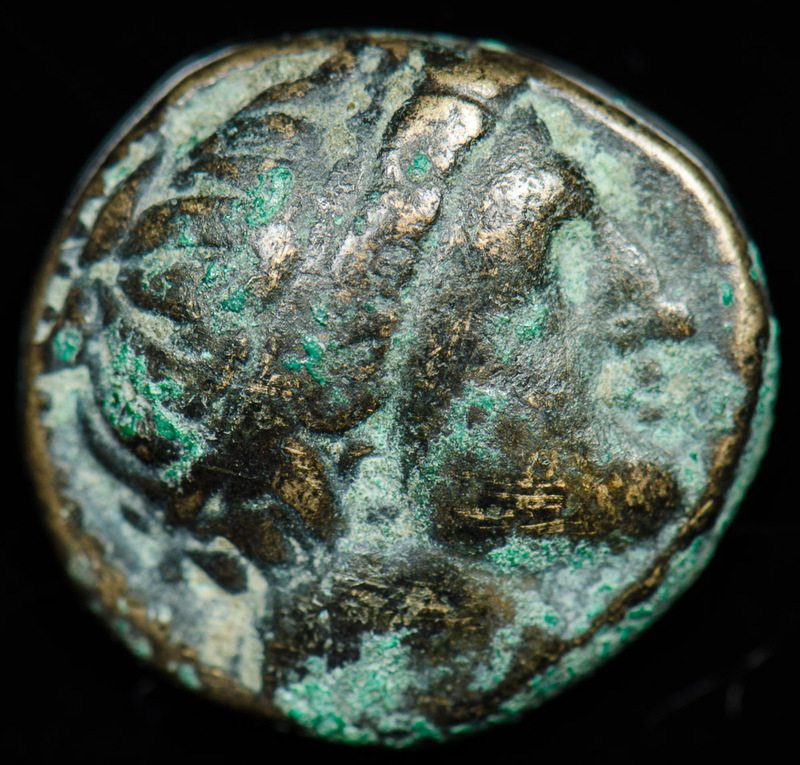 HoodedHawk » Ancient coins: Ptolemy III, Philip II of Macedonia, etc. Ancient coins: Ptolemy III, Philip II of Macedonia, etc. 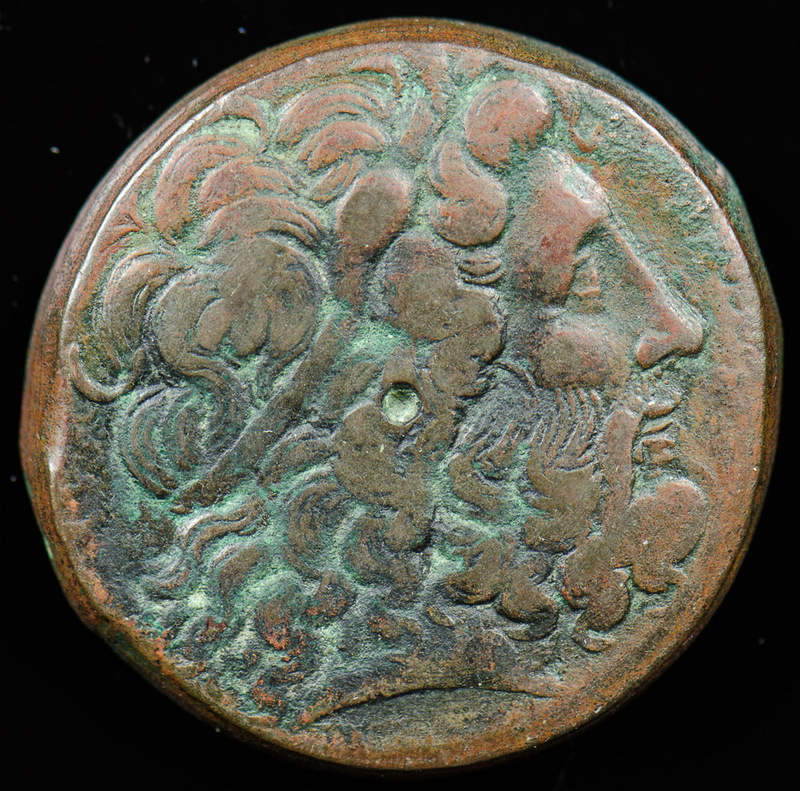 Comments Off on Ancient coins: Ptolemy III, Philip II of Macedonia, etc. Received some “new” ancient coins today. Preston was already in bed by the time I got home from work, so he hasn’t even seen these yet! I used the rest of the evening to photograph the coins. They range in size from ~38mm down to a tiny ~12mm (from Corinth, c. 300 B.C.). 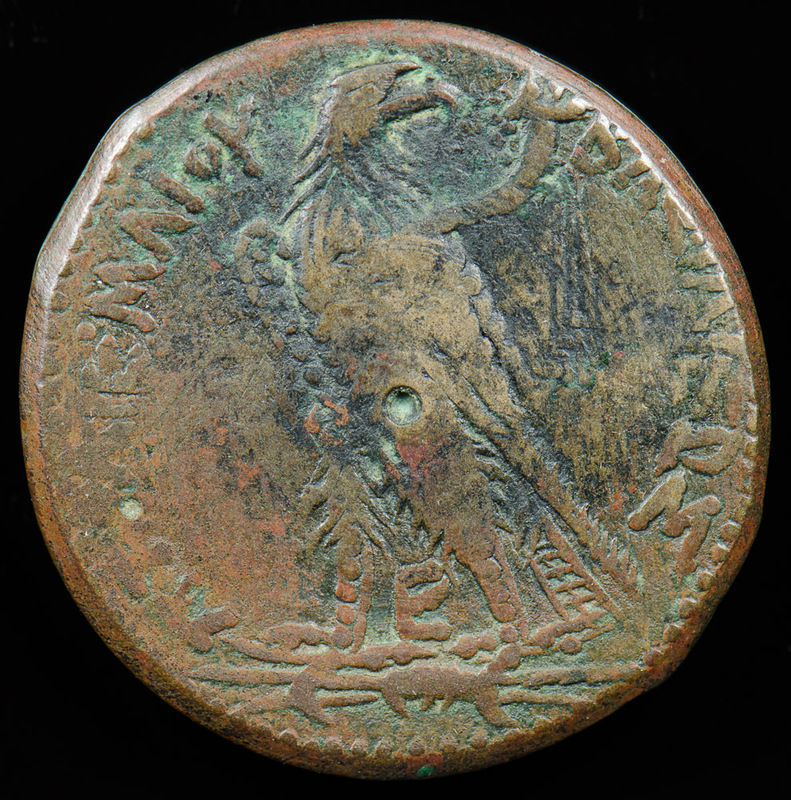 Preston was looking forward to the HUGE bronze Ptolemy – 43g, and almost the size of an American Silver Eagle – and from around 240 B.C. 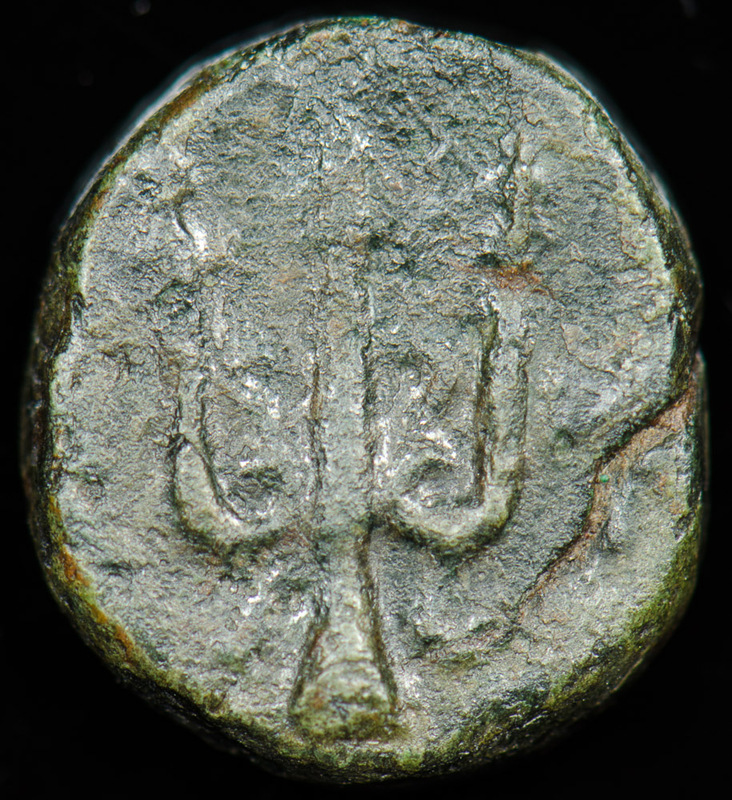 The Ptolemaic Kingdom coin (Ptolemy III) was minted in Alexandria, Egypt over 2200 years ago. As Cleopatra was Ptolemy VII, this was a few generations before her. Ptolemy III Euergetes was the third ruler of the Ptolemaic dynasty in Egypt. He promoted the translation of Jewish scriptures into Greek as the Septuagint. Due to a falling out at the Seleucid court, his eldest sister Berenice Phernophorus was murdered along with her infant son. In response he invaded Syria, occupied Antioch and even reached Babylon. This war, the Third Syrian War, is cryptically alluded to in Daniel XI 7-9. The Ptolemaic kingdom reached the height of its power during his reign. 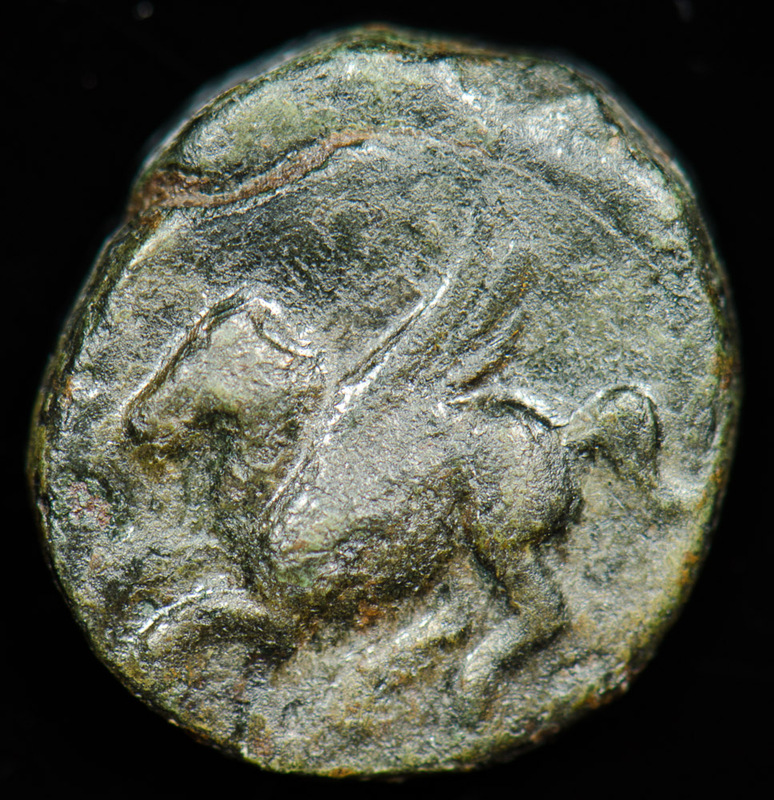 The next coin is from King Philip II of Macedonia. Philip II became the ruler of all Greece when he defeated the Athenians at the Battle of Chaeroneia in 338 B.C. 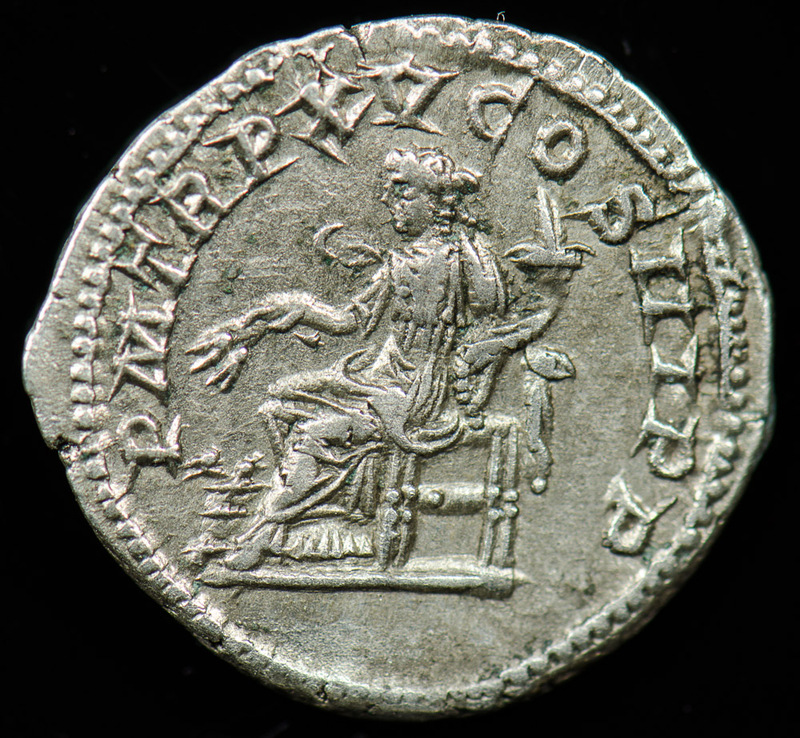 Philip personally selected the design of his coins. 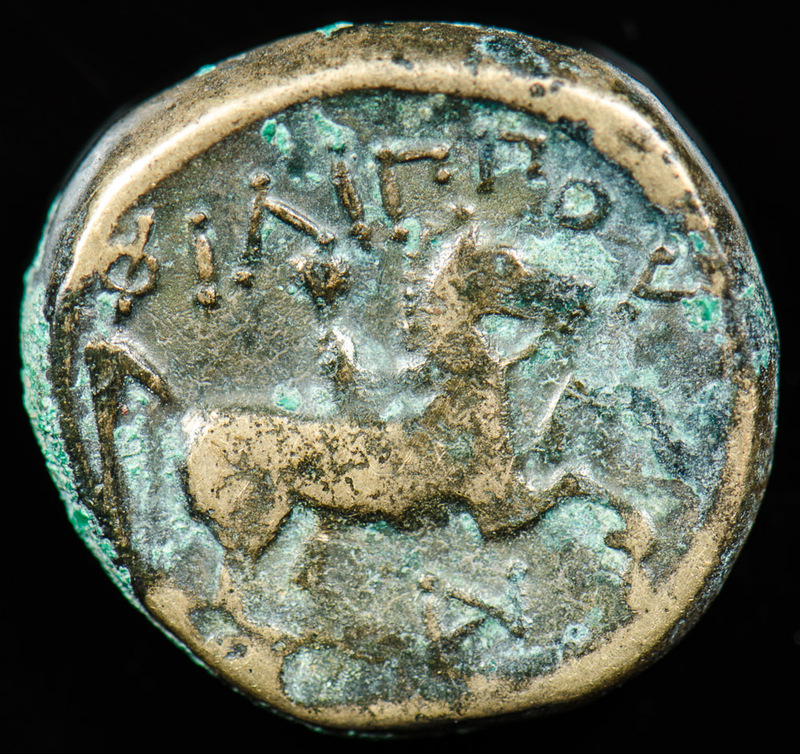 His horse, on the reverse of this coin, won a race in the Olympic Games in 356 B.C., the year his son Alexander the Great was born. His son was a wee bit successful: conquered most of the known world before he died young at 33. Following is a little critter from Corinth. I couldn’t resist a piece of history, 2300 years old, for $25.00. Found at Halos in southeastern Thessaly in 1994. 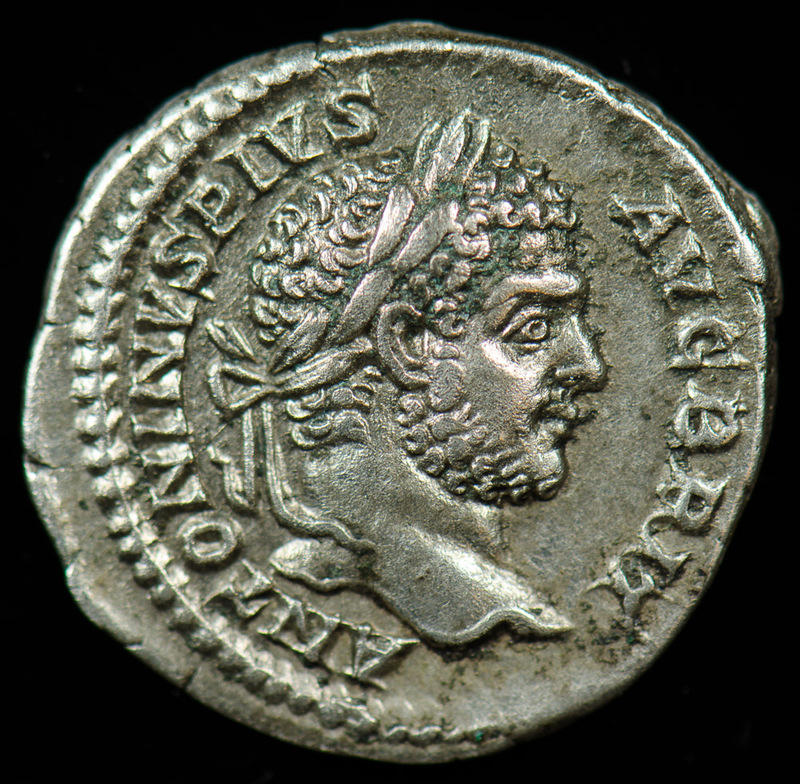 The last two coins are Roman: Caracalla and Aurelian. Annona (reverse of Caracalla) was worshipped in Rome as the goddess who prospered the year’s supply of grain. She was represented on an altar in the capitol. The three principal granaries of Rome were Sicily, Egypt, and the African provinces. Annona civilis was the grain which was purchased each year by the Roman state, then imported and put into storage, reserved and distributed for the subsistence of the people. Annona militaris was grain appropriated for the use of an army during a campaign. 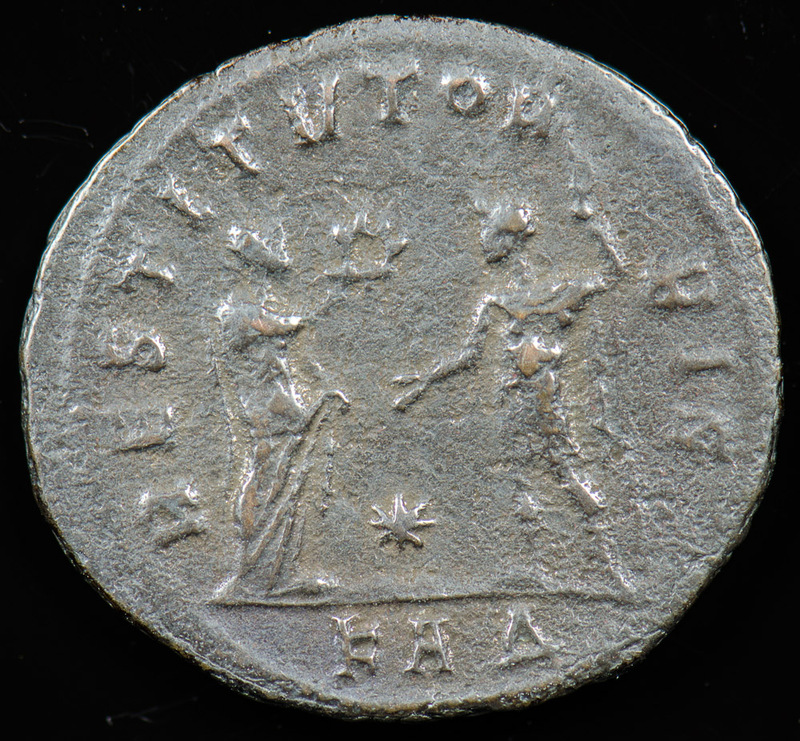 In 274, Rome greeted Aurelian as Restitutor Orbis (“Restorer of the World”) and accorded him a magnificent triumph (victory procession), which was graced by his captives Tetricus I and his son Tetricus II. Aurelian’s conquests of the Palmyran Empire and the Gallic Empire reunited the Roman Empire. This coin is very rare; none of the reference books have this combination of obverse and reverse. Neat! 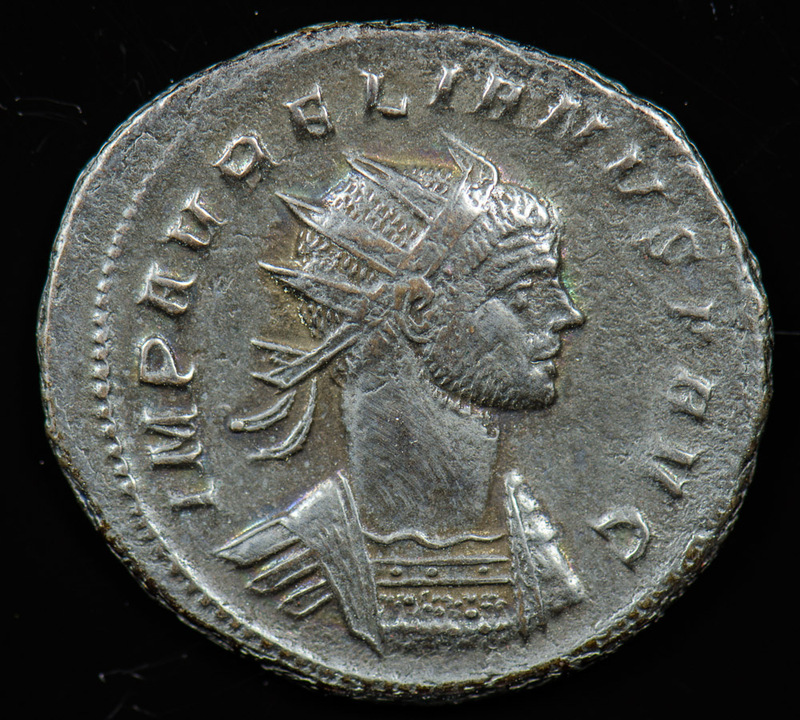 Aurelian; 270-275 A.D.; Silvered antoninianus; Reverse: RESTITVT ORBIS (restorer of the world), female standing left presenting wreath to Aurelian, standing right in military dress and holding long scepter in left hand. ; 3.495g, 23.9mm Very Rare. It never ceases to thrill – touching an object that was in circulation a couple of THOUSAND years ago.